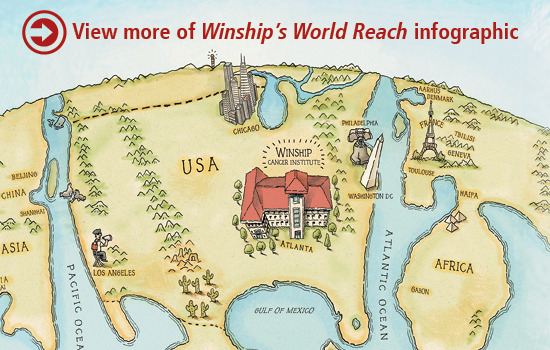 Winship plays a vital part in the worldwide effort to better detect, prevent, and treat cancer. Here is just a sampling of the places and organizations where Winship clinicians and researchers work alongside international colleagues to defeat cancer. 1. Atlanta: American Cancer Society, CDC, Georgia Center for Oncology Research and Education, Georgia Tech. 2. Washington, DC: American Society of Clinical Oncology, American Society for Therapeutic Radiology and Oncology, US Dept. of Defense, NASA, National Cancer Institute. 3. Philadelphia: American Association for Cancer Research, ECOG-ACRIN Cancer Research Group, NRG Oncology. 4. Chicago: American College of Surgeons, College of American Pathologists, International Chemical Biology Society, Society of Surgical Oncology. 5. Los Angeles: Children's Oncology Group, International Myeloma Society. 6. São Paulo, Brazil: National HPV Immunization Campaign. 7. Shanghai, China: Smoke-free home policy research. 8. Beijing, China: Peking University. 9. Chennai, India: The Center for Cardiometabolic Risk Reduction in South Asia Surveillance Study. 10. Haifa, Israel: Middle East Cancer Consortium. 11. Johannesburg, South Africa: Chris Hani Baragwanath Hospital. 12. Tbilisi, Georgia: Tbilisi State Medical University. 13. Geneva, Switzerland: Union for International Cancer Control. 14. Aarhus, Denmark: Aarhus University. 15. Toulouse, France: International Associated Laboratory.